Generously scaled bedposts add a touch of drama to the rustic look. Product Description Romantic Countryside. 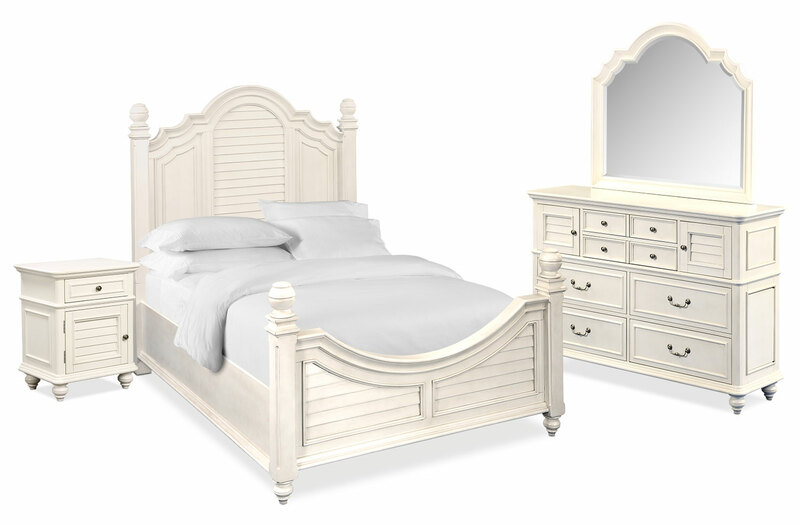 Channel the serenity of a quaint cottage with the Charleston King poster bedroom set. The polished louvered headboard perfectly pairs with dramatic arched moldings to bring out the charm of the rustic countryside. Pewter-finished hardware and lovely tapered legs add exquisite finishing touches, providing you with a well-furnished bedroom. Customer assembly required. Unique Features: Spacious drawers leave plenty of room for clothing and linens. A secret dresser drawer and hidden side panel with jewelry hooks allow you to safely store valuables. Pewter-finished hardware adds rich detail. Tapered legs and generously scaled posts capture a romantic look. Rustic paneled headboard adds depth and movement to the bed. The painted finish highlights the silhouette and design of this bedroom furniture. Constructed of durable rubberwood and hardwood solids for resilient strength. Drawers: Ball-bearing glides ensure easy drawer operation. Cedar-lined bottom drawers are ideal for heavy sweaters and linens. English dovetail drawer construction guarantees long-lasting durability. Felt-lined top drawers protect delicate valuables.